If you’re traveling on business, you can enjoy the convenience of conducting your business meetings at our hotel in Fort Worth. We offer over 2,050 sq. ft. of meeting space along with audio/visual equipment to accommodate your needs. The Hotel Boardroom is ideal for one-on-one media interviews and is also available for catered and non-catered small meetings. It is equipped with a screen, LCD projector and laptop. Whether to engage in corporate, networking, education or cultural activities, Hoilday Inn’s Ball Room provides for a multi-purpose use with impressive high-tech services. 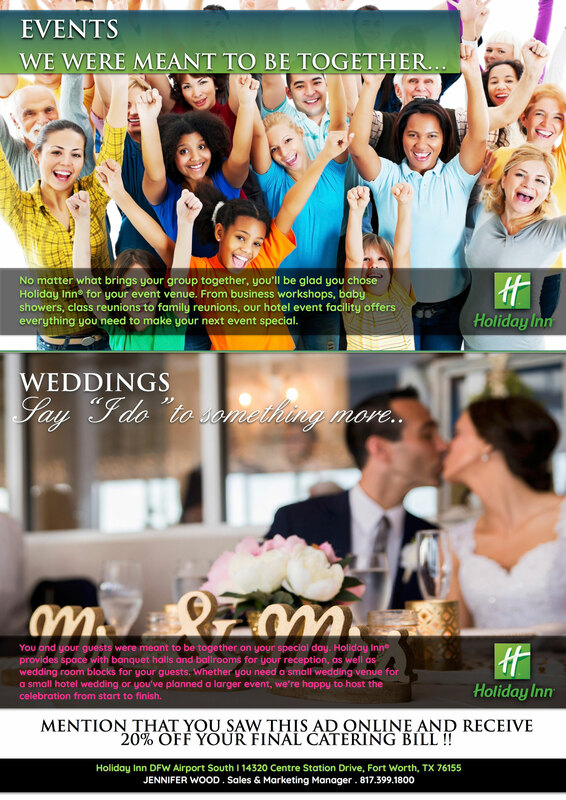 Our Hotel meeting and pre-meeting space are ideal for a company event, wedding reception or private party. If you have questions or would you like to book your meeting or event by phone, contact us at 817.399.1800 or Email our Meetings and Events manager, Karen Hobbs at khobbs@hidfwairport.com.